And it's over, the five day long madness. The getting up in the morning to wear a crisp cotton saree, or showing around the pandals to my non bong friends like a matter of pride, the ceremonies at home, the sound of Dhak playing making your heart flutter, staying out way into the night with cheerful companions,the dhunochi aaroti dance, food- oh the food! And just... the festival in itself. The five days that you feel alive, the most. I know I mentioned the anticipated depression, but it ain't there really. I'm quite overwhelmed as always, and happiness is enjoying the quiet lazy epiphanies by sadness. Durga Pujo this year was of another kind. Absolutely magnificent in most aspects and a little nostalgic in few.. the rituals were all the same. The pandals, most of the people, the feeling of belonging under one very colorful umbrella of happiness, and perpetual excitement of every minute.. yes, it was all the same. But also absolutely different in a whole new level. Pujo started with Panchami when Rob and I fought pretty much the Odds of all the screwed network connections of Vodafone (hehh! Quite a night that one!).. Shashti, my ladies came over. That was altogether a trip of a different kind. Seven saree-clad beauties marching the roads with loud laughter, sipping on chuski, and a whole lot of fun.. Saptami was my day out with the other craziness oriented loves. Neha, Sheks,Chika, Rohan,Apu, Rukmani, Shuvro and okay basically a whole bunch of insane people! That was the ditch-Cr.Park-Day. We went and checked out the pandals outside Cr.park and they were such beauties I tell ya. Not to mention, the night ended with a drive to India gate wearing Devil horns and glow in the dark shades :-P Ashtami, there was the main puja at my place.. Shiv came over, showed her around, bumped into Kanz and gang. 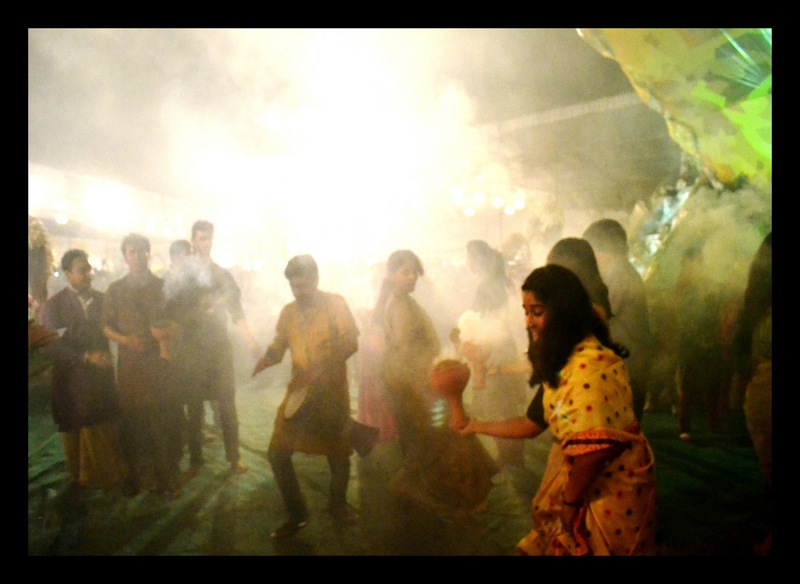 Following which was the night that I felt alive the most- the Ashtami arati at K-block, where I did the dhunochi.. The rush, the intoxicating feeling of dancing in front of the idols proceeding to a trance is the one feeling that would stay and refuses to go away. And Navami. The cherry on the cake. The huge Bhattacharjee family rented a bus and off we were to rule the Puja pandals of New Delhi! And heh, um, then. For the keeps- the Navami night party at Cheeka's. THAT, I won't forget. Ever. No, not ever! No further details on that,err. And finally, Bhashan..... The Visarjan saw us bongs go wild on the streets dancing to the beats of Dhak.. what a visarjan.. damn. So yeah. It's ended. The madness is over, and it's time to get back to the thick stick of Everyday. But as cliched, however very honest- and thus begins a year long wait. A wait that's always so worth it. It's been a kickass Pujo. Something I rather didn't expect.. I wish I had more to say, for this post. I anticipated a lengthy post describing every minute detail of the odyssey.. but I think this is as much as I'd want to share, the rest is to stay with me only. For that's how amazing this pujo was, and I'd rather leave it to that. It's beauty within me. This Pujo was the onset to a whole new vision, a vision I ignored, to now realize that it was actually bliss. You know? The details hardly matter, now. What matters is, that you had fun. Some great fun. So yeah. It's nice. :) And obviously, such rituals allow us, to stay close to our family, our old friends. By the way. Y U POST NO MORE PHOTOS? @Charu: Indeed we are. No questions asked! And haha thanks a lot :) We have Diwali to look forward to now! and all good things come to an end.. what a harsh fact! Nil, Shubho bijoya!! 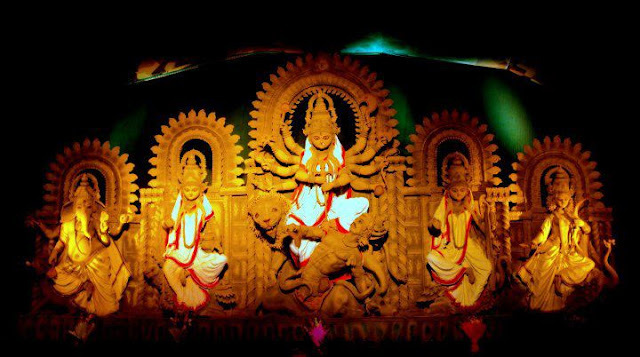 All I have been doing these two days is calling up far distant relatives who I have never seen or have talked to and giving them my bijoyar pronam; dugga pujo is strange ain't it! And damn it's over. Btw Ladakh was heaven and you look so festive in the dhunuchi pic! @Sam: Shubho Bijoya,love! Haha I'm guessing we all have been doing the same. It's just an add on when you already live in a joint family. Hehe. Thank you!